Window restoration is always a key element to preserving old buildings. This view peers north from the top floor of the Administration Building at the Central State Hospital site, photo taken earlier this year. This is the second piece of a three part series covering the revitalization of Central State Hospital, the former insane asylum that closed its doors in 1994. The first piece touched upon some of the history of the 160 acre mental health complex on Indy’s near westside. 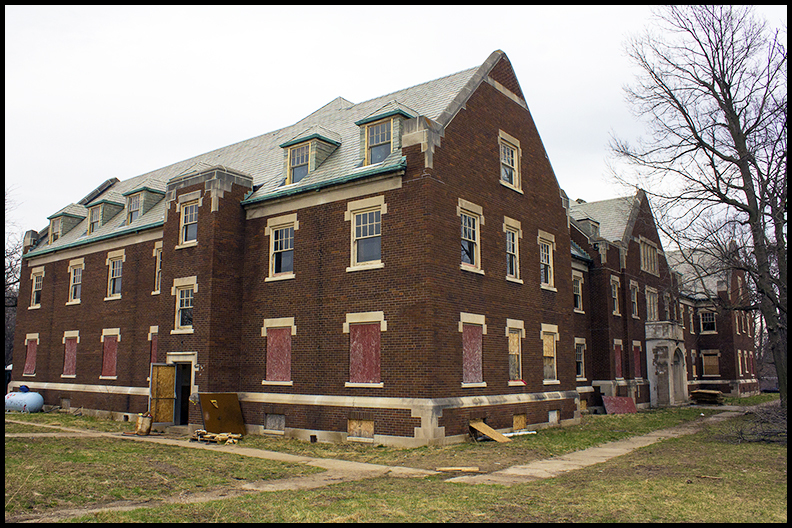 This week, we cover some of the new developments at Central State, focusing on the restoration of a few historic buildings by Reverie Estates. Though Central State sat predominantly disused after Governor Evan Bayh ordered the facility shut down in 1994, the hospital’s grounds were not entirely abandoned. 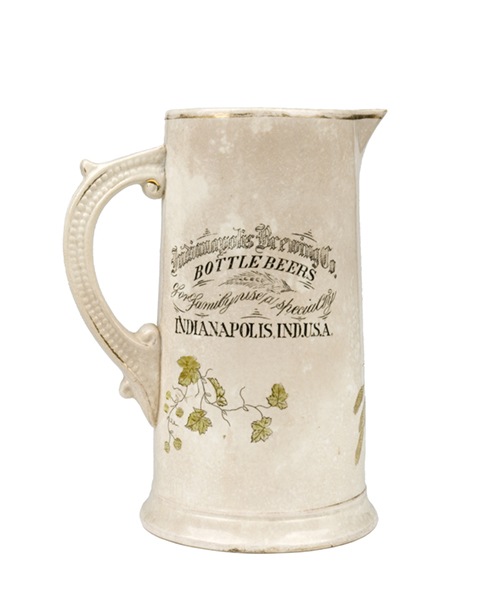 The Indiana Medical History Museum, established in the Old Pathology Building in 1969, has welcomed visitors since 1984. Along Warman Avenue, on the eastern edge of the property, sit a row of houses built in the 1940s initially intended to be built as physician’s residences to entice doctors and nurses with free room and board. However, due to a lack of enthusiasm by staff to live in the new, small double houses, they were instead used to house veterans and as exit houses for released patients transitioning back into society. 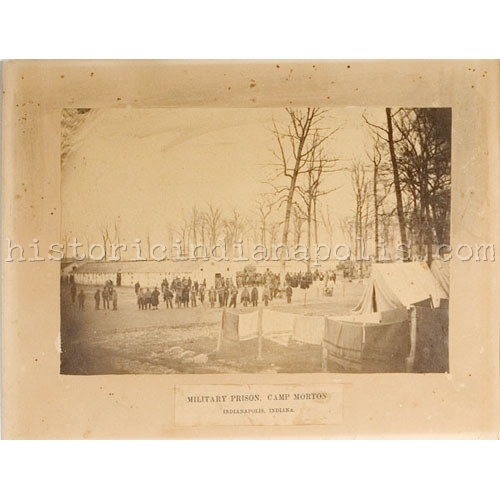 The Indianapolis Police Department Mounted Patrol established stables for their horses on the hospital’s western perimeter in 2003. In 2005, the short-lived Beckmann Theater Company featured a site-specific presentation of IUPUI professor David Schanker’s play Asylum, in a theater constructed inside of the 120 year-old Laundry Building, which later housed cars for the IPD motor pool. Stranger still, Olympic diving hopefuls once practiced their twists and turns on trampolines and harnesses in Central State’s Bahr Building, a one-time treatment center for children and adolescent patients, built in 1960 on the southeastern part of the grounds. In March of 2003, the city purchased the 160 acre property from the state, and soon after, requested proposals on how best to redevelop Central State– for which, planners would have to navigate a complex number of challenges regarding the site. Firstly, four protected historic buildings (highlighted above in a graphic from the Central Greens LLC 2007 proposal which can be found here) would have to be restored and incorporated into the overall plan. Additionally, planners would have to make a decision on whether or not to save or raze the remaining dozen or so buildings that stand in various stages of disrepair. Hidden below the unkempt grounds were thousands of feet of asbestos laden service tunnels that connected each building, underground fuel tanks, the buried foundation of the enormous Seven Steeples woman’s building that had been razed in the 1970s, and a section of unmarked graves of patients in the northwest corner of the property. Ultimately, the city chose Mike Higbee, president of Development Concepts INC and onetime Director of Metropolitan Development under Mayor Bill Hudnut, and Charlie Garcia, President of Garcia Construction Group, to redevelop the site. 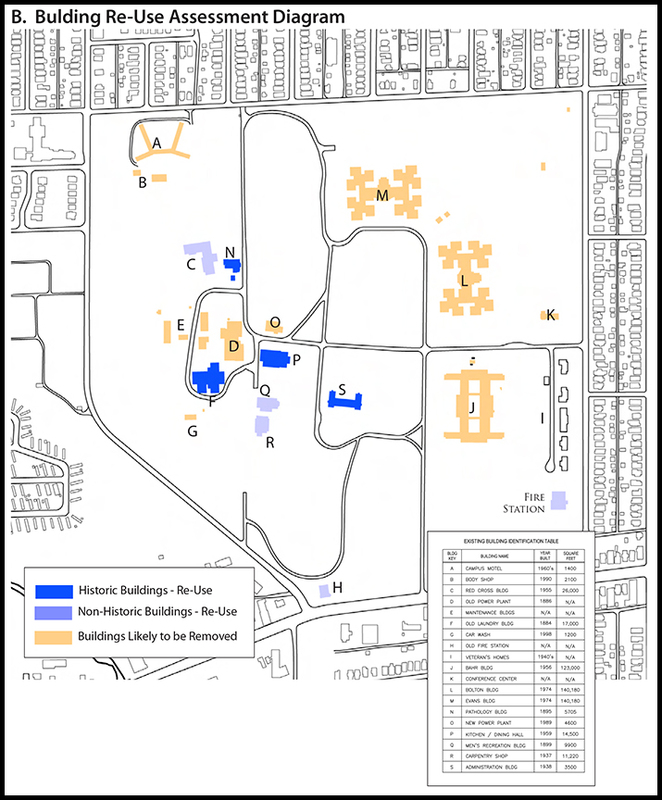 The city was presented with the aforementioned Central State Development Land Use Plan in August of 2007, proposing an array of park space, residential and commercial units, surrounding a centralized cultural village incorporating the repurposed historic buildings. Then the economy took a bit of a nose-dive. The Administration Building undergoing the first stages of rehabilitation earlier this spring. Fast forward to 2011. With the economy back on the upswing, the delayed redevelopment efforts re-started. 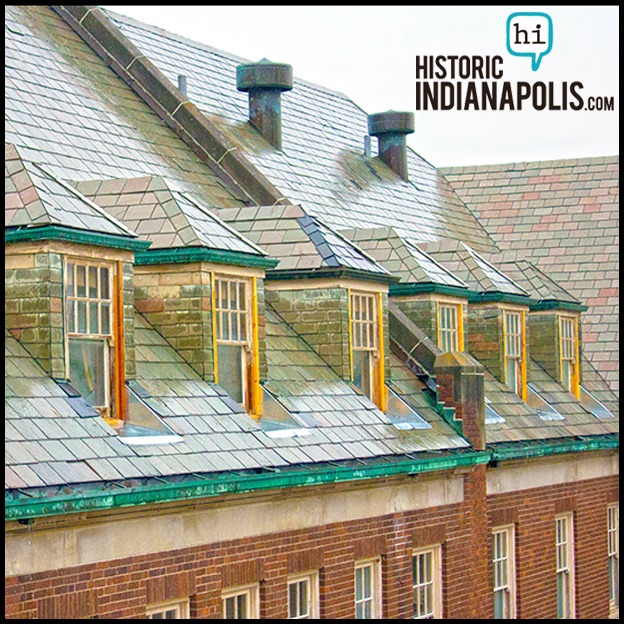 The Carmel based company Pedcor were among the first to act, opening the aptly named “Steeples on Washington” apartments on the southeast corner of the grounds. But as of 2013, there was still no concrete plan regarding the redevelopment of the historic buildings to be included in the “cultural village” at the heart of the massive grounds. That is, until Reverie Estates entered the picture late last year. 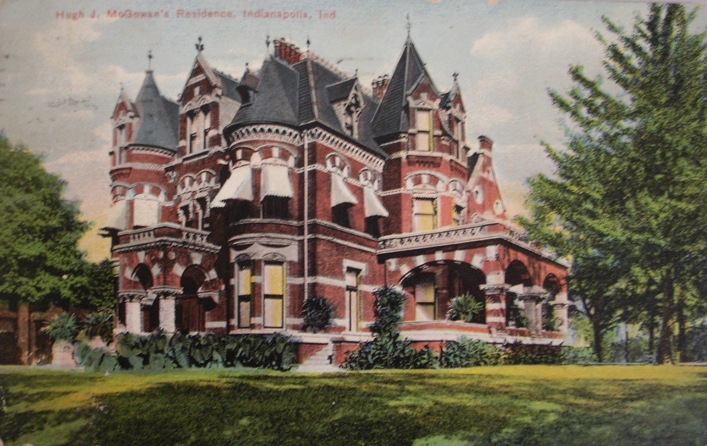 Having already purchased and restored several historic apartment buildings, such as Penn Arts and the Piccadilly near downtown Indianapolis, Reverie would first attack the most pressing challenge: what to do with the building most associated with Central State: The Administration Building. 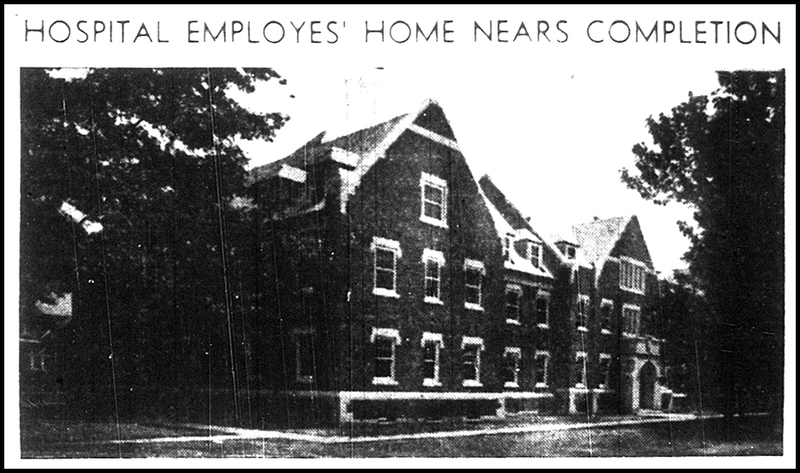 The newly constructed Administration Building from an August 17, 1939, Indianapolis News article. Phase one of Reverie’s rehabilitation plan was to revitalize the two and a half story, brick and stone Administration Building into student housing. Those disinclined to the notion of possibly living in a building that once housed patients of the hospital should note: though this building is frequently mistaken for one of several patient wards, it was constructed specifically to house the hospital’s staff. 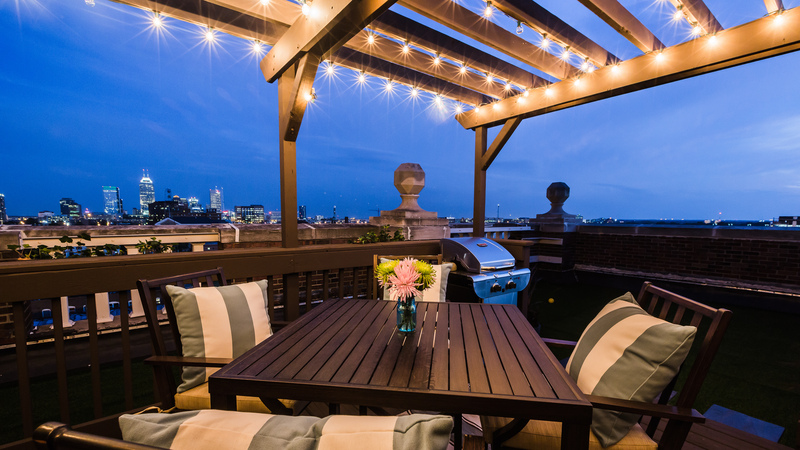 Designed by Purdue-educated architect, O. A. Tislow, and completed in 1939, the “Admin Building” housed 100 employees of the hospital, in gender-segregated, dormitory-style rooms, while allowing spaces for doctor and dentist offices. 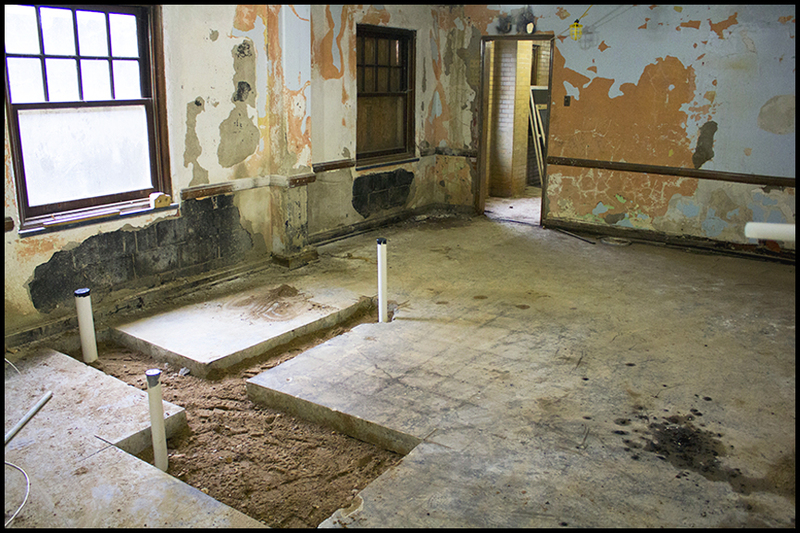 Years of water damage and decay had to be stripped away before renovation plans could move forward, as with this soon-to-be bathroom. When Reverie Estates began work on the Administration Building earlier this year, 20 years had passed since its doors had been ordered shut by then Governor Bayh. 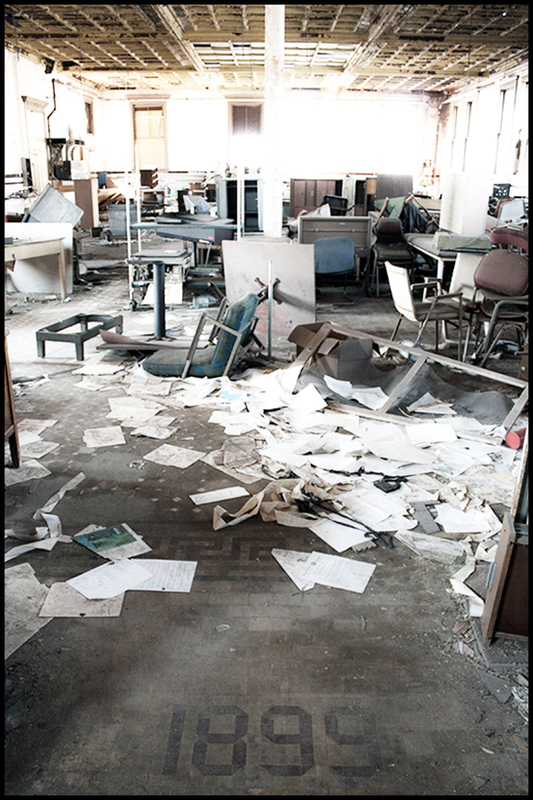 The building was a wreck of its former self– its basement was partially flooded, rooms and halls were littered with scattered remnants of its medical past, and sprinkled with refuse and graffiti from two decades worth of vandals and thrill seekers. Many of the tile floors throughout the building are damaged, but restorable and will be reutilized. 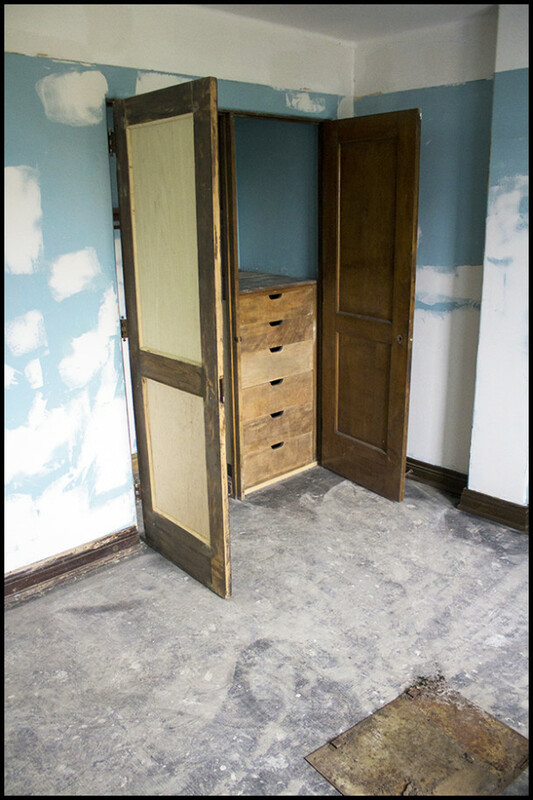 After first clearing out years of refuse and repairing the damage inflicted by the combination of mother nature and neglect, the task at hand is to retain as much of the historic character of the building as possible, while updating the rooms to meet the needs of a modern world. 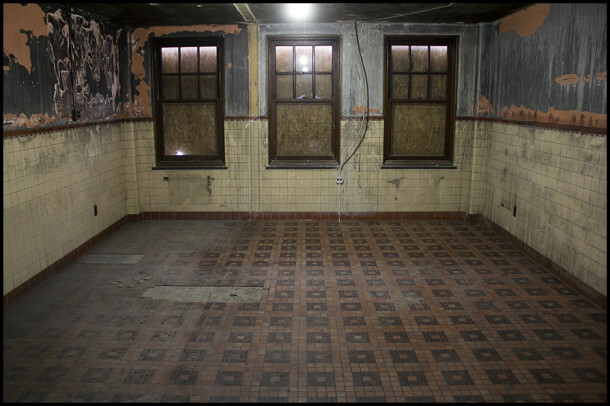 The original terrazzo and tile floors, such as the one above, will be repaired and restored where possible. Surprisingly, each former dormitory room was still outfitted with its original hardwood closet and shelves, miraculously spared despite the years of abandonment. Each unit will be stripped and resurfaced to recreate the original finish and completed with new hardware. Wood paneling and parquet floors also amazingly survive exposure to both the elements and vandals. Even more amazingly, a pair of wood paneled and parquet floored libraries have survived as well, with minimal damage despite exposure to the elements. These too, will be restored and updated to their original purpose. In addition, recreation rooms, kitchen and the communal areas will serve the needs of IUPUI and other students preparing to start school this fall. 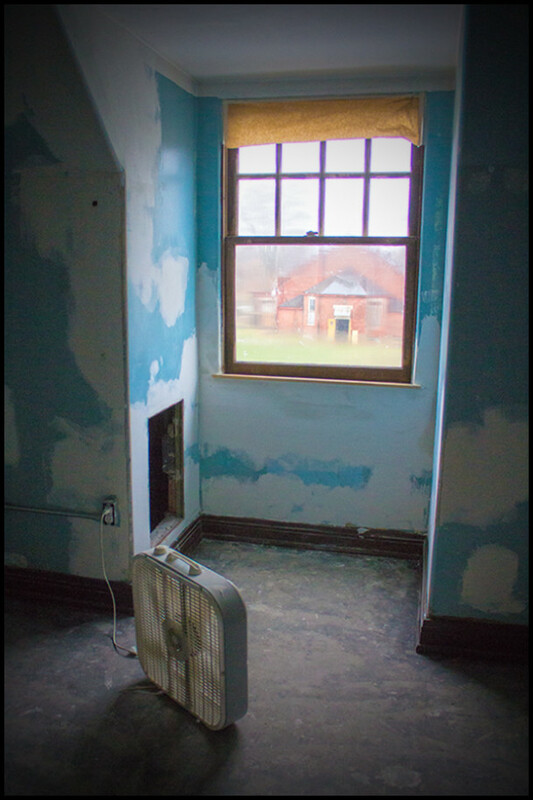 A fan helps to dry mends to the plastering around a window overlooking the Men’s Recreation Building. For the final part of this three part series, we’ll revisit the construction site at Central State, for some after photos, to see how the project has progressed, and cover Reverie Estates’ plans for the nearby Men’s Recreation Building. 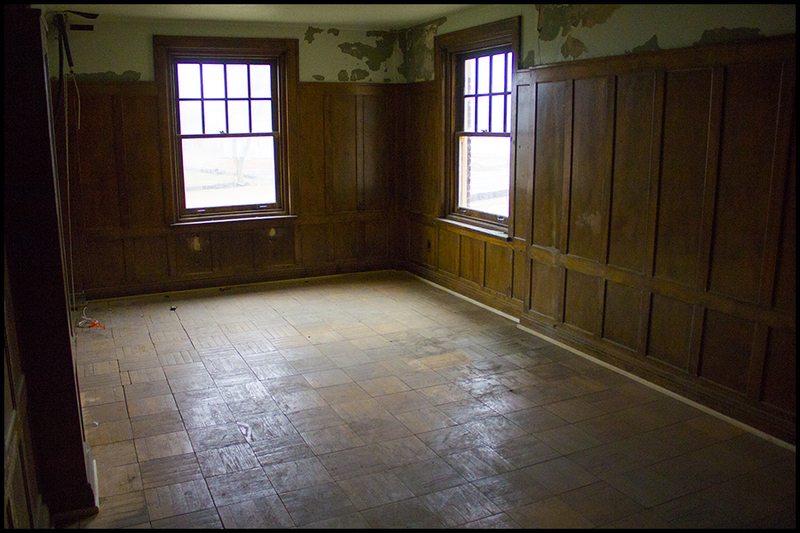 The once trashed floor of the 1899 Men’s Recreation Building, also to be featured in upcoming part three. Great 2nd installment…..love the photo gallery. I don’t know the answer …but why wasn’t the building emptied of all chair, desk, etc when Gov. Bayh closed the doors? It just contributed to the decay of a beautiful building- inside and out. If buildings are going to be abandoned by the orders of public officials….then the owners or govt. should be made responsible for cleaning the debris at time of closure. Many historic building could be saved if care was taken to preserve them until future use. As someone who has spent quite a bit of time exploring and photographing abandoned asylums, hospitals, apartments, churches and most recently, an abandoned Poconos honeymoon resort, I find that almost every building is full of things you wouldn’t expect to be left behind. More often than not, when a business fails or building is locked up for one reason or another, I think there is always the intent to come back later and remove the furniture and whatnot inside. Very rarely are the doors locked on, say the Poconos hotel for instance, without the owner believing that they just need to get X,Y, & Z in order financially and they’ll come back and get things up and running. Next thing you know, the place has been closed for a few decades. As far as this example, the sheer size of Central State presents a pretty big problem. What do you do with several hundred twin-sized beds of various states of cleanliness, and desks and chairs and lamps and various other pieces of furniture that are very often institutional when new and then years out of style when the doors are locked. To remove all of them takes both a lot of money and a lot of man-hours (money again) to remove and then you have to put them somewhere. So, more often than not, the doors are simply locked and people walk away, the very buildings in which they are locked functioning as an impromptu storage facility. I think only on the rarest occasions do people, organizations or governments walk away from buildings with the explicit intent of “abandoning” them. With Central State, governor Bayh’s priority was to close the hospital. What to do with the buildings and their contents was a problem that could be tackled after that fact. I doubt anyone planned on it taking 20 years to accomplish. I don’t know that the things inside of a building are usually to blame for the damaging the integrity of abandoned historical buildings. Mother Nature is the foremost problem, with rain and moisture attacking buildings that have no one to maintain them and fix leaks. And whether they are full of items left by previous occupants or not, ne’er-do-wells will always force their way in, breaking doors and windows to either scavenge for copper pipes (as I encountered men doing while photographing the Keystone Towers pre-demolition) or just teens looking for the strange thrill of smashing the porcelain bathroom fixtures of nearly every abandoned building I’ve ever photographed. I’m definitely interested in hearing your thoughts on the place once you move in! Great pictures and article. My only criticism is the use of the words “insane asylum”. This term is archaic, perhaps in use when Central State was built, but nowadays a pejorative word. Many of the helpless people who once lived there had no other option when released but to fend for themselves as homeless and jobless. I was hopeful that at least part of Central State could have been renovated and reopened as a safe environment for our mentally ill in Indiana. I certainly agree that the decision to simply closer Central State and force hundreds of patients in need of housing and guidance on to Indianapolis streets rather than create a new facility to help treat mental illness was a poor one. In my uneducated opinion, I’m guessing that years of negative publicity regarding patient care and mistreatment led the powers that be in 1994 to sever ties with the property all together, rather than to try to continue in some way. Regardless of how modern a new facility on the property might have been, it would still carry the burden of its history. That being said, my use of the term “insane asylum” is indeed archaic, but I use it to describe an institution that was in itself archaic. To refer to a location as a “lunatic asylum” or “mental institution” casts a property as one that was created to provide care that is no longer a part of modern medical science. That being said, while my use of the term may disparage the antiquated hospital itself, it is absolutely not my intention to disparage the poor souls who passed through its buildings in its nearly 150 year history. I remember the park that was behind it. I played there when I was a kid. My grandpa worked t the park and kept it clean and kept all the toys locked up when we were done with them. It was across the street from st. Anthony’s church on Warman street. My brother used to go up to the fence behind the hospital and watched to see if anyone would come out. We were scared, but nothing ever happened. Wow–I feel for the people that were locked up in there. Thank you for sharing this story. I wonder what happened to all of the hospital files that were just lying around. I’d think some of those might be important. Both for historical purposes and to keep patient files confidential.